The Original Bolt Basket - Don't Settle for Imitations! If you have ever tried cleaning nuts, bolts, washers, or small fittings in your cabinet or parts washer, you know what a challenge it can be. Small items are hard to handle, and usually end up flying out of your glove and into the machine. Simple and easy-to-use design will save you time and increase your glove life. 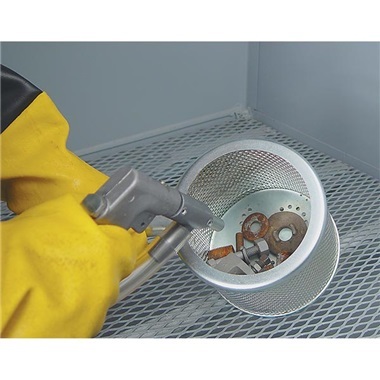 Simply put nuts, bolts, brackets, etc., into Bolt Basket and hold handle while cleaning. Shake basket to rotate items and clean all surfaces. Also works great for cleaning parts in a parts washer. Within seconds, you can clean several small items at one time without losing any! Long-lasting, 13 gauge stamped steel top and bottom won't warp or be blasted through like lightweight imitations. Extra-long 5" handle provides positive gripping inside cabinet or parts washer. 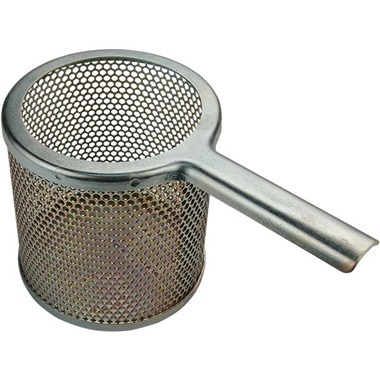 Basket bottom has draining holes to let abrasive or cleaning fluid flow through. COMPARE! 6" wide, 6-1/4" high, 5" opening.